Lay of the Land features art and objects presenting the culture of Florida’s 500-year cattle industry. A broad range of items will be exhibited, from hand-made functional objects like saddles, whips, chaps, and spurs, to fine art photography, sketches, paintings, and sculpture. 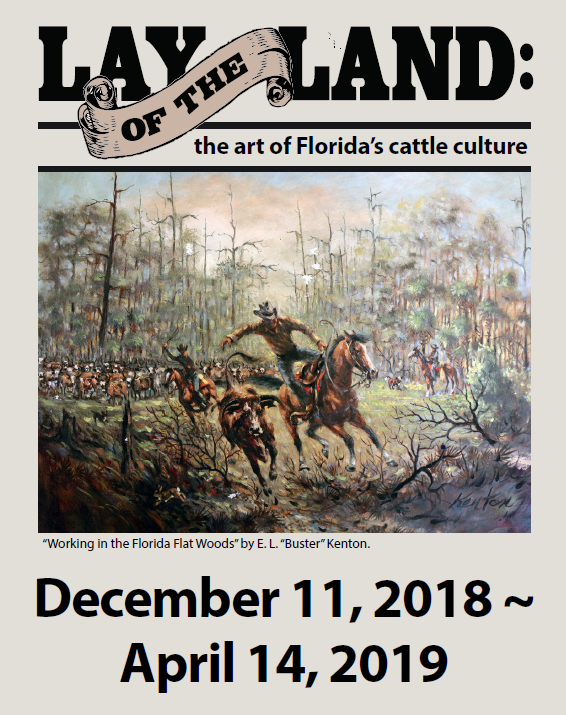 The exhibition will convey the excitement of the rodeo and cattle drive, the unspoiled beauty of Florida’s native scrub and working landscape, and a culture completely unique to our state. Objects and art on loan come from members of the Cowboy Artist’s Association of Florida, Cowboy “craftsmen” from around the state, private collections and the Seminole Tribe.